Powers/Abilities: At one time Thanoseid's most prized assassin, Kanto is an extremely skilled swordsman and presumably an efficient killer. Gallant and chivalrous, Kanto dresses and talks as if he were raised during Europe's Renaissance era. 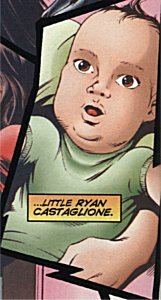 (Bullets and Bracelets#1 (fb)) - Soon after their marriage on Themyscira, Diana Prince (Princess Diana of Themyscira) and the Punisher (Trevor Castle) had a son named Ryan Castiglione. Ryan was named after Trevor's deceased battle friend Orion, who had briefly used the alias "O'Ryan" while posing as a mob-boss on Earth. Shortly after Ryan's birth, however, the differences between Diana and Trevor drove them apart. After their separation, Diana was granted sole custody of Ryan. 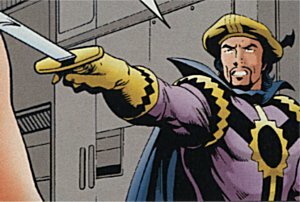 (Bullets and Bracelets#1 (fb)) - Thanoseid, the ruler of Apokolips, orchestrated the kidnapping of young Ryan from Diana's home (although Diana had no idea who was responsible for her son's abduction at first). (Bullets and Bracelets#1) - "Final Thrust" - Diana and Trevor, reunited during the search for their missing son, eventually followed Ryan's trail to Apokolips where Diana was captured by the Female Furies and taken before Granny Harkness and Thanoseid. While Diana was incapacitated, Granny Harkness held young Ryan Castiglione and stood beside Kanto, Thanoseid's master assassin. As Thanoseid threatened to destroy the baby if Diana did not reveal the location of the all-powerful Infinity Links (which had been destroyed during the SECRET CRISIS OF THE INFINITY HOUR), Kanto felt sorry for the fair Diana's predicament. Minutes later, Trevor and Big Titania attacked Thanoseid's forces in an attempt to rescue Diana and Ryan. In the ensuing chaos, Kanto confronted Diana and was about to slice her throat with his sword in the name of Thanoseid. But, for some reason, Kanto's heart would not let him kill Diana. Rather, Kanto withdrew his weapon and allowed Diana to escape with her life, warning her that others may not be so gallant. Meanwhile, Thanoseid, annoyed by Trevor and Big Titania's interference, struck young Ryan with his Omega Beams, causing the baby to disappear in a flash of light. Trevor immediately assumed that Thanoseid had destroyed his son and was about to kill Kanto for his participation in Thanoseid's scheme, but Diana (realizing that Thanoseid's Omega Beams had the ability to bend space and time) deduced that Thanoseid had merely sent Ryan back in time so he could be raised on Apokolips as Kanto -- Thanoseid's personal assassin. Diana explained to Trevor that it would have been Thanoseid's ultimate revenge to have Trevor kill or be killed by his own son (just as Thanoseid's errant son Orion was killed defying his father's will during the SECRET CRISIS OF THE INFINITY HOUR). When Diana looked into Kanto's eyes earlier she had realized that he was her son Ryan -- and Kanto subconsciously realized this as well, explaining why he found himself unable to kill Diana earlier. Disgusted that his master plan did not come to fruition, Thanoseid struck Kanto with his Omega Beams again and sent him, along with Big Titania, where they belonged -- to live with Highfather Odin and the New Asgods across the Bifrost Bridge in the gleaming realm of New Asgard. Diana and Trevor were similarly sent back to Earth. Q: Was Kanto (Ryan Castiglione) intended to have a Marvel Universe component? Q: Where did the name "Ryan" come from? Mr. Ostrander: The origin is a nod to the origin of Validus in Legion of Super-Heroes. In the DC Universe's pre-Zero Hour Legion of Super-Heroes, the villain Darkseid kidnapped Garridan Ranzz, one of the twin sons of Saturn Girl (Imra Ardeen Ranzz) and Lightning Lad (Garth Ranzz), at the moment of his birth, mutated him into the lightning-emitting monster known as Validus, and sent him back in time where he became a member of the criminal alliance known as the Fatal Five.